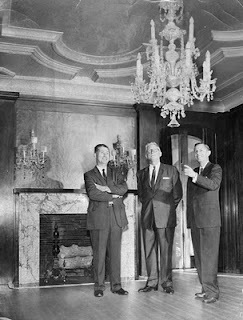 Karin wins with her 9:06 a.m. Tuesday guess "Officials tour Wrigley Mansion, circa 1958. 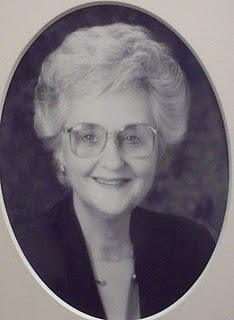 Donated to COP after Mrs Wrigley's death as permanent headquarters for T O Roses." In the photo above, Pasadena Mayor Ray G. Woods (left), Tournament of Roses Association Raymond A. Dorn and Chairman of the TofR Board Max Colwell admire a crystal chandelier during a tour of the Wrigley Mansion on Oct. 13, 1959. 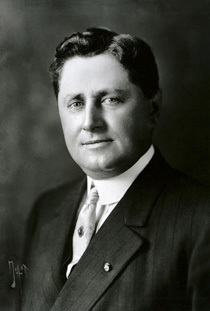 Like so many eastern and midwestern captains of industry, William Wrigley Jr. (below), the chewing gum king and founder of the Wm. Wrigley Jr. Company, came to Pasadena every winter to escape freezing weather (he also had controlling interest in Catalina Island and had a spacious home there, as well as homes in other cities throughout the world). The Italian Renaissance-style mansion was designed by architect G. Lawrence Stimson, son of George Stimson, a real estate and dry goods tycoon. After construction was completed in 1914, the elder Stimson sold the property to Wrigley (below) for $170,000. After Wrigley passed away in 1932, Mrs. Wrigley spent most of her time in the Pasadena home, which had always been her favorite. 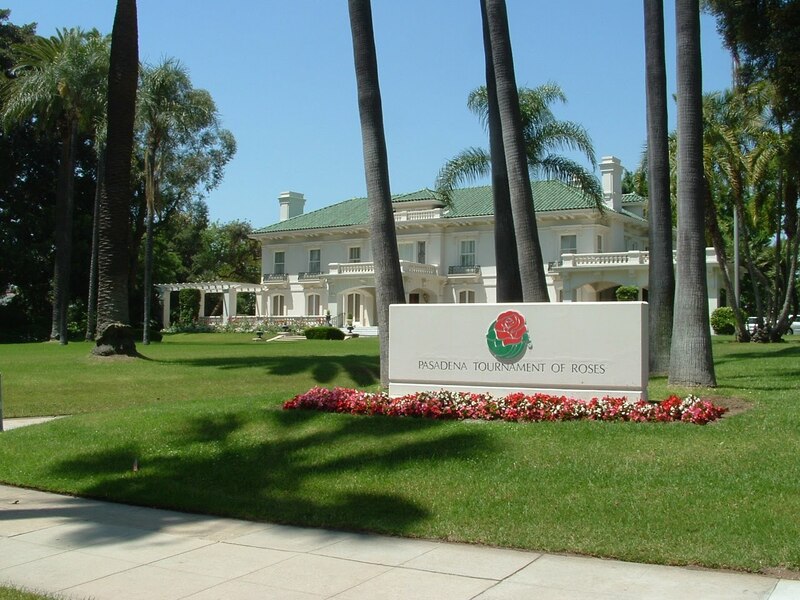 When she died in 1958, the family donated the mansion and surrounding 4.5 acres of gardens and grounds to the City of Pasadena on the condition that it would become the permanent headquarters of the Tournament of Roses. 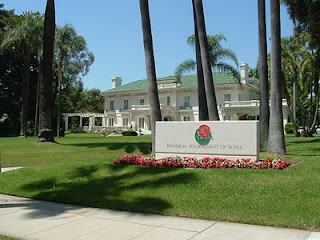 Now commonly known as the Tournament House, free tours of the Wrigley Mansion are offered every Thursday from 2 to 4 p.m. from February through August; once September rolls around, the mansion is closed to the public so Tournament of Roses officials, staff and volunteers can plan the Rose Parade and the Rose Bowl Game. Many thanks to Los Angeles Public Library, Tournament of Roses and Wm. Wrigley Jr. Company. My eldest nephew Rich married my new niece-in-law Nicole on Saturday at a beautiful outdoor wedding at her parents' home in Prather, Calif., in the foothills of the Sierras. It was magnificent, and we all enjoyed ourselves long into the evening. And those shoes? She was smart enough to change out of them when the dancing started! 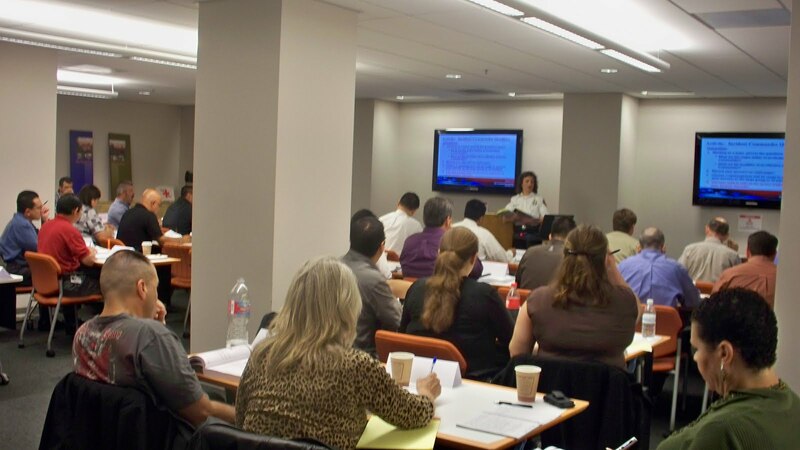 All day yesterday and today, and then next Wednesday and Thursday, I'm in federally mandated National Incident Management System (NIMS) training. 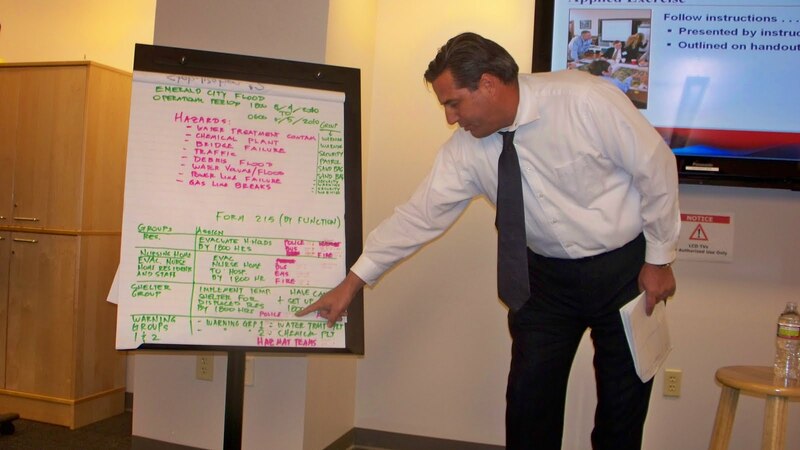 NIMS was put in place to provide a consistent, nationwide template that enables federal, state and local governments to work together in preparation for, prevention of, response to and recovery from disasters. 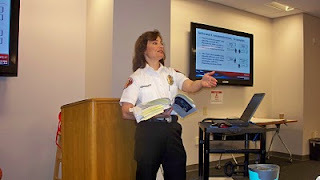 Fire Chief Dennis Downs and Lisa Derderian, our emergency management coordinator, are leading the training. 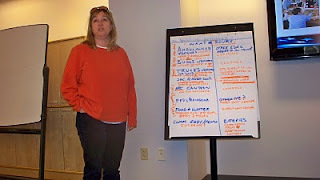 The training has included small-group exercises to make disaster planning and response decisions based on various scenarios. I'm in Team 2 during these exercises. Team 2's incident commander is Larry Hammond (second from left with Chief Downs looking on), who in real life is our purchasing administrator. Under NIMS, the incident commander oversees the incident response and is the final authority on decisions. 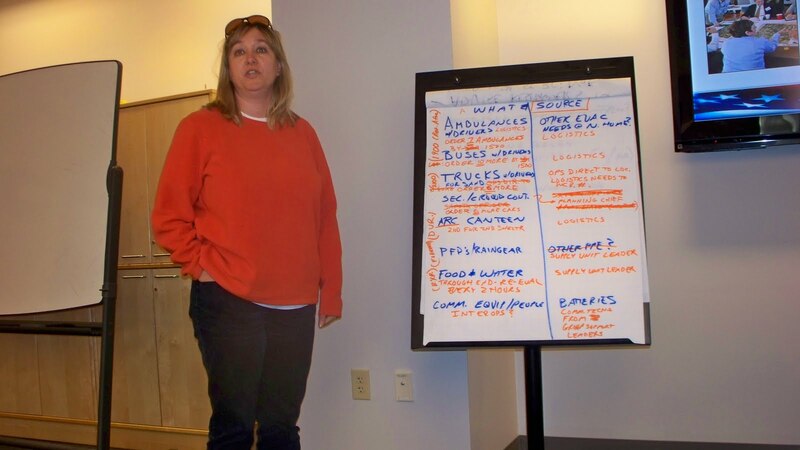 Then the various teams reported out on how they would handle decisions during disasters, from public safety to infrastructure repair to evacuation logistics to filling out obligatory federal forms. 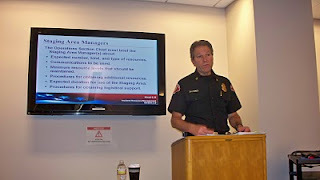 Of course, there's a critical PIO function to any disaster, which I'll explain later. Stay tuned for more after the training is completed, including what I learned and why it matters. 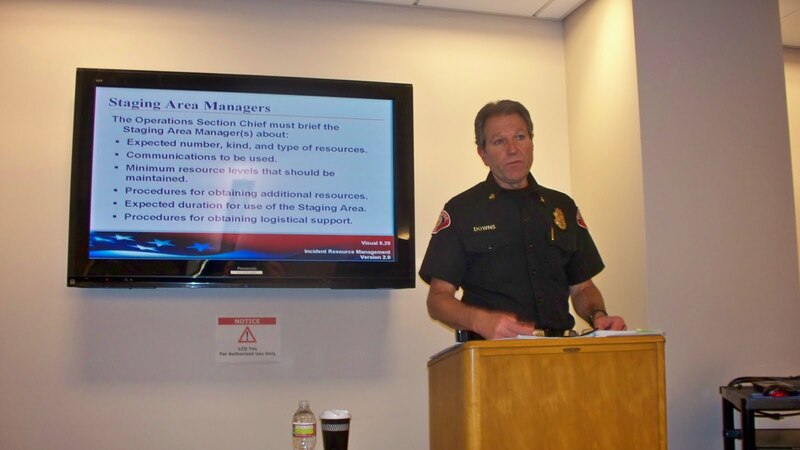 The Burbank, Glendale and Pasadena PIOs get together every so often to discuss shared issues and catch up on each other's projects. We rotate cities, and today it was Pasadena's turn. We met at Smitty's* on South Lake and had a bittersweet meeting. 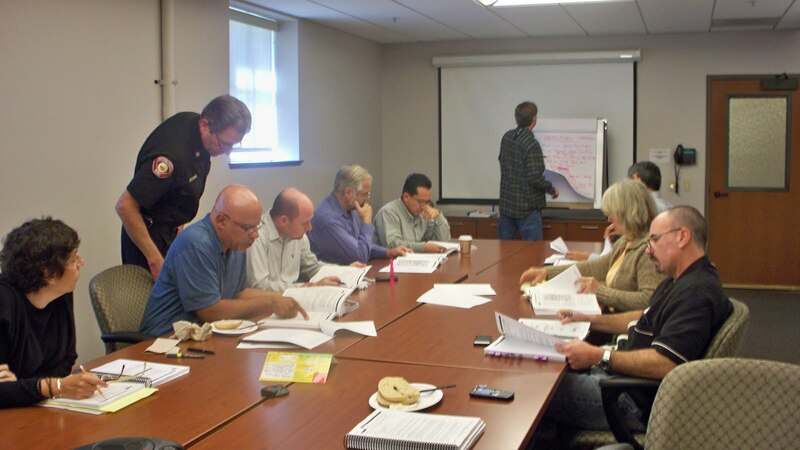 I say that because Ritch Wells, PIO for the City of Glendale (at left in the photo above), is retiring next month. We decided he'll be the charter member of the Tri-cities PIO Alumni Association and will be required to attend all future meetings! And, of course, I'll roast Ritch but good at his retirement party. 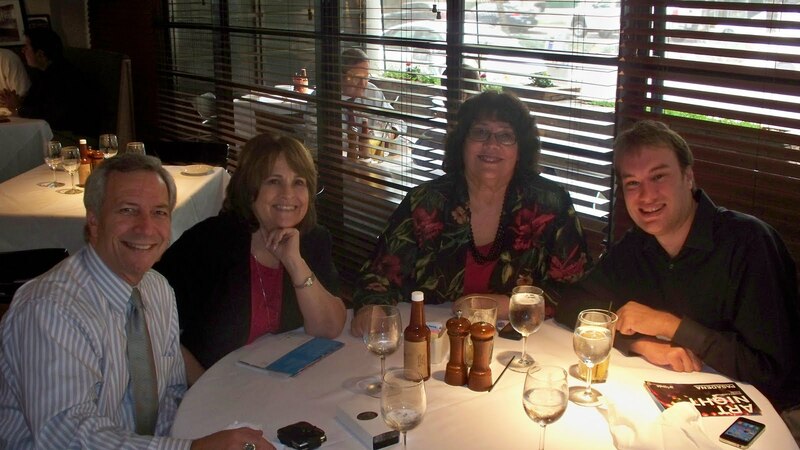 Also in the photo are Keith Sterling (right), PIO for the City of Burbank, Vicki Gardner, assistant PIO in Glendale, and yours truly. 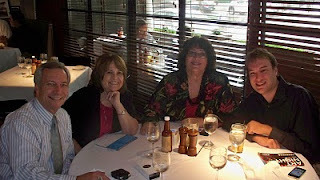 Linda Centell, Pasadena's assistant PIO, joined us for lunch but had to leave before this photo was snapped. I've known Ritch for 15 years -- ever since I sat on the interview panel that made the recommendation to Glendale's city manager to hire him. Our instincts definitely were right on! Mystery History will return next week. I simply haven't had time to research a photo. *Mike, before you ask, three of us had a special salad of the day with red and green cabbage, chicken, cranberries and other yummy ingredients, one had a hearty Cobb salad and one had meat loaf. All the meals were delish! Of course, it's the cornbread at Smitty's that knocks everybody's socks off (we ordered a pan for the table). Business Life Magazine is celebrating its 20th anniversary with a Sept. 22 "Women Extraordinaire 1990-2010" gala at the Glendale Hilton Hotel. Why does this matter to Pasadena? 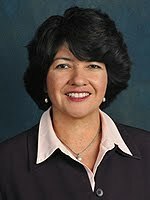 ...and Pasadena Water and Power General Manager Phyllis Currie. John Krikorian, publisher of Business Life, said this about all of the honorees: "They led the way for others and selflessly gave of themselves, with passion, to support their communities through service organizations, business and government." Other Pasadena women to be honored include Gerda Govine, Jaylene Moseley, Marsha Rood, Ruthie Hopkins, Nell Hollmand, Aleen Boladian, Stacie Olivares Howard and Juanita West-Tillman. I liked the variety of guesses for this one, from "miners digging out the last of our coal and/or gold reserves" to "it has something to do with a dam being built at the bottom of Hahamongna." Frank Girardot wins with his 3:56 p.m. Tuesday guess "building of the rose bowl in arroyo seco." But the project really began with laborers and mules. Imagine the back-breaking work of digging out all that dirt along with all those rocks and boulders. 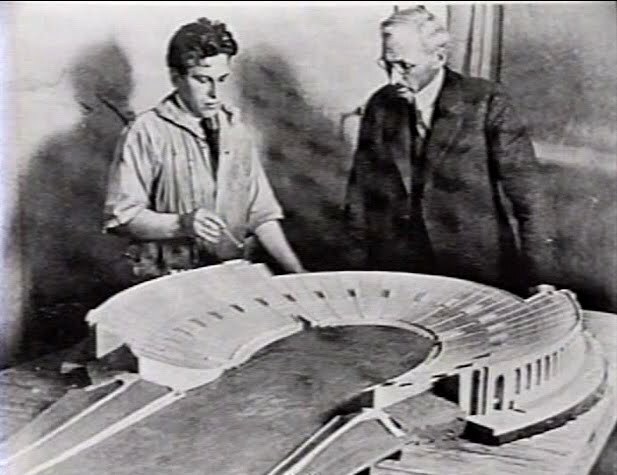 In 1920, to fund the stadium's $272,000 construction, Myron Hunt, Tournament of Roses President William Leishman and several others devised a plan to sell subscription tickets for stadium events for the next 10 years at a cost of $10 per person per year -- $100 total -- all up front. It worked. 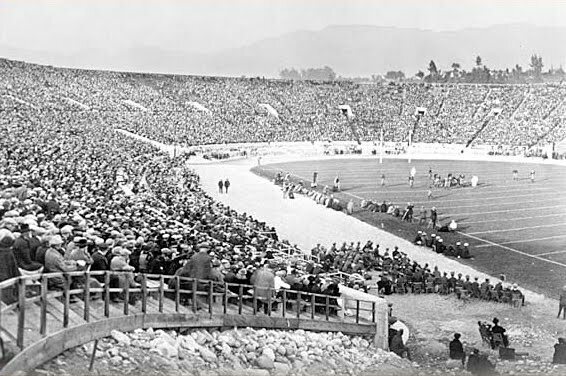 Construction took less than a year; the stadium was ready in time for the 1923 football game with USC vs. Penn State (USC won, 14 to 3). And now the stadium is poised for a $171 million renovation and expansion. Design plans are going through the commission process and the financial plan will be coming to the Pasadena City Council soon. It's a far cry from the $272,000 raised to build the stadium 90 years ago but it sure will be worth it! Many thanks to the Pasadena Museum of History, Rose Bowl Stadium and Tournament of Roses Association. 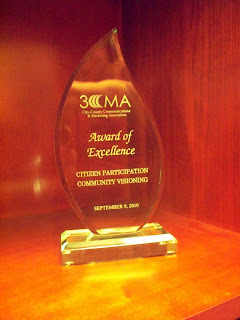 I was thrilled to receive the Award of Excellence at the annual conference in Atlanta of my national professional organization, City-County Communications and Marketing Association (3CMA), for phase one of the community engagement program for Pasadena's General Plan update that took place over the course of nine months in 2009. 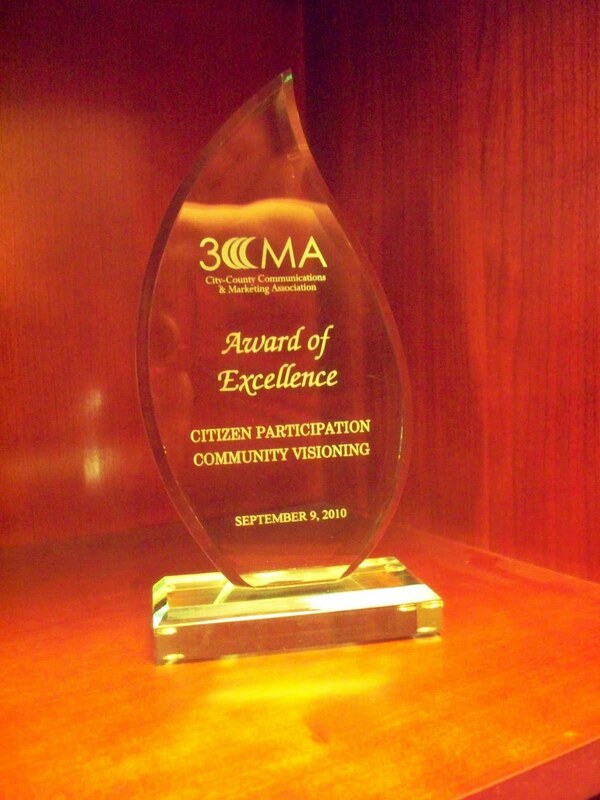 I submitted our entry in the category Citizen Participation/ Community Visioning. The program included stakeholder interviews, MoveAbout tours, a speaker series, community workshops, an open house extravaganza and a youth component. 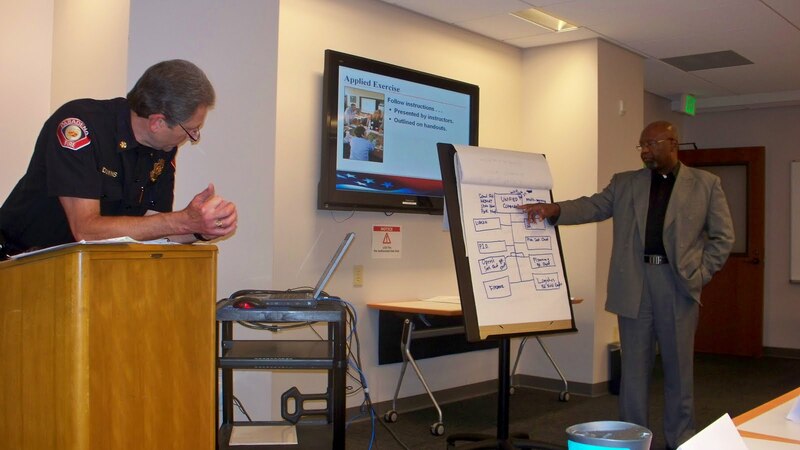 This was a team effort that included the Planning and Development Department, the Public Affairs Office and the General Plan Update Advisory Committee. Many thanks to all staff involved, including Stephanie DeWolfe, Jason Mikaelian, Scott Reimers, Vicki Carrillo, Zack Stromberg, Susan Soto and others. In addition to attending several workshops during the conference, I co-led two of them: "Crisis Communications and Social Media" and "Going Digital." Here I am at the podium just before the "Going Digital" session began, with my long-time pal Heather Morris, director of communications for the Port of Long Beach (photo by Margaret Magee of the Port of Long Beach). It's always good to get away for an annual conference, network with peers from around the nation, learn a little and teach a little. Yesterday (Thursday) morning I accompanied Mayor Bill Bogaard and City Manager Michael Beck to the Pasadena Police Department for a briefing on our new BearCat armored vehicle. In the photo above, (from left) Lt. John Dewar explains some details to Mayor Bogaard as Cmdr. Mike Korpal, Michael Beck and Police Chief Phil Sanchez look on. Its purpose is to preserve the safety of police officers and citizens during potentially deadly incidents. Purchased with $265,000 in grant funding, the BearCat was delivered to the Pasadena Police Department recently. It's the only one of its kind in the San Gabriel Valley and is a regional SWAT vehicle. So Pasadena owns it, but it is lent to other jurisdictions in the SGV as needed. 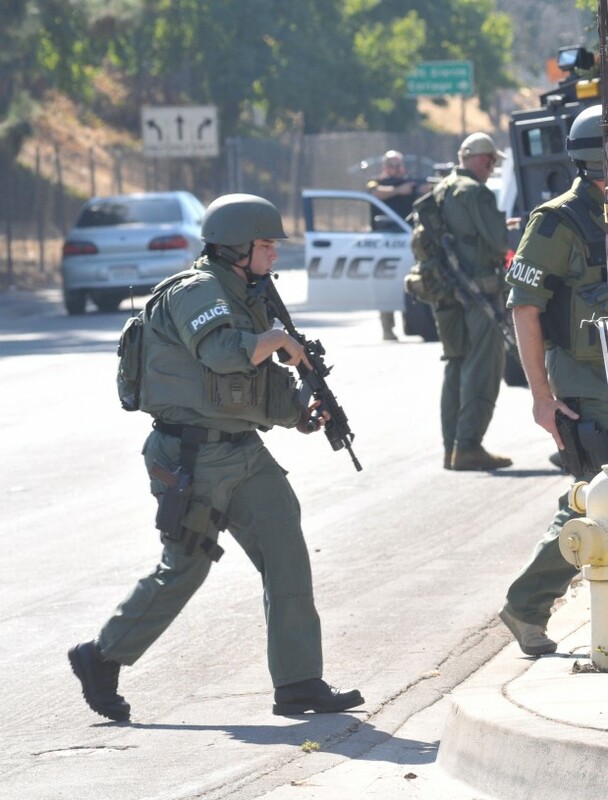 Within hours of our briefing, the BearCat was used in Monrovia during a seven-hour standoff between a car thief and Arcadia, Monrovia and Pasadena police after the suspect led police on a chase through a couple of jurisdictions. Lt. Dewar told me today via e-mail that the BearCat helped transport officers from various agencies plus equipment to the scene. It also helped some very frightened bystanders get away from the potentially deadline scene. "It turned out that eight people had locked themselves in a business nearby and were afraid to leave the building since the suspect was in close proximity," he wrote. "Our officers drove the BearCat to the rear door of the business; all eight people climbed in and were driven safely out of the danger area." Petrea knew the where-are-we with her 8:36 a.m. Wednesday guess "The location is Central School, which was built in 1878 at the corner of Colorado and Fair Oaks," so I'm giving her the fabulous prize. But nobody knew the what's-happening part. 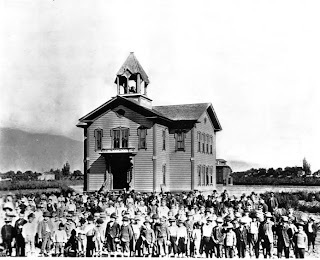 In the photo above, people have gathered from far and wide in 1886 to bid on parcels that will be divided up from the five-acre Central School property. 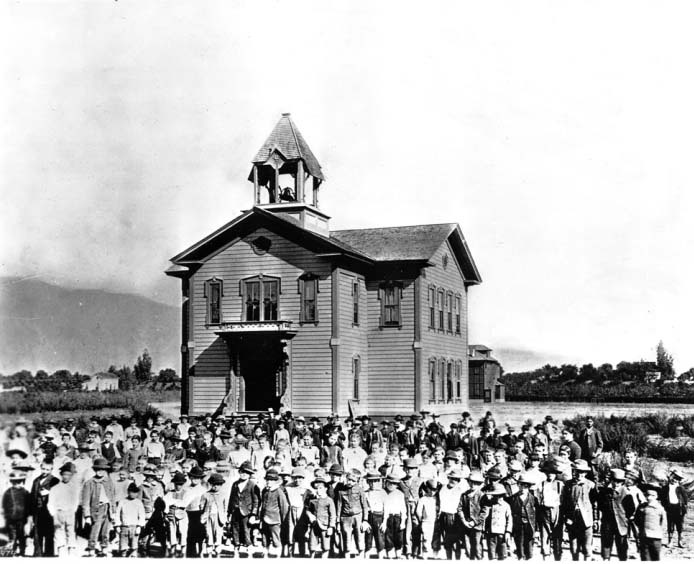 The school, at left, was built in 1878 on the southeast corner of Colorado Street and Fair Oaks Avenue. Across the street are businesses under construction on Colorado Street. 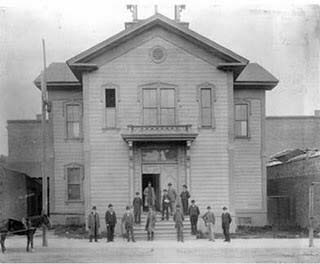 After the lots were auctioned off, the school was moved to Raymond Avenue at Green Street and a portion of it was leased to the newly incorporated City of Pasadena to serve as the City Hall. 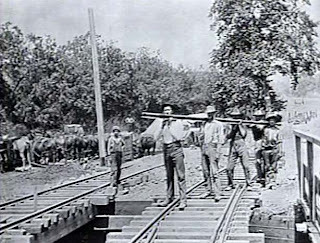 When the Indiana Colony was established in 1874, the intention was for it to be a mostly agricultural community. 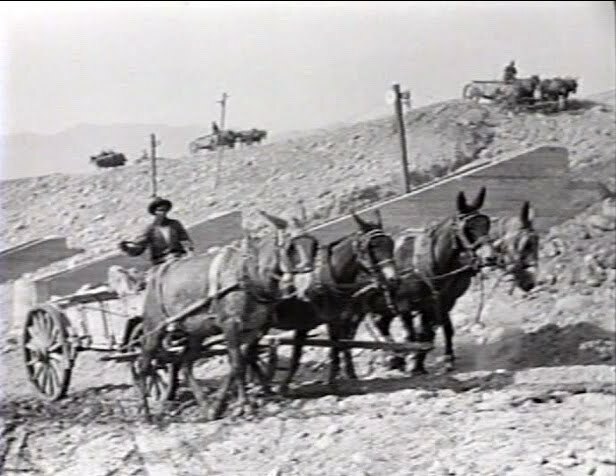 But then a rail line was built from L.A. to Pasadena, followed by the completion of the Santa Fe Railroad's transcontinental route that went right through this community. Advertisements were prevalent in every major newspaper in the east and midwest, luring people to Southern California so they could begin living the good life in year-round sunshine. With a price war among railroads, a person could ride from Kansas City to Los Angeles for as little as $8. 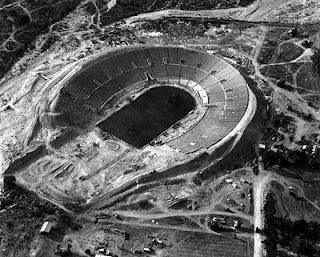 This marked the beginnings of a population explosion in Pasadena. 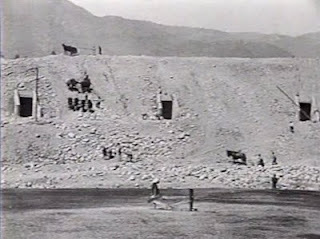 First there was the auction sale in 1885 of 20 acres at Colorado and Orange Grove owned by Dr. O.H. 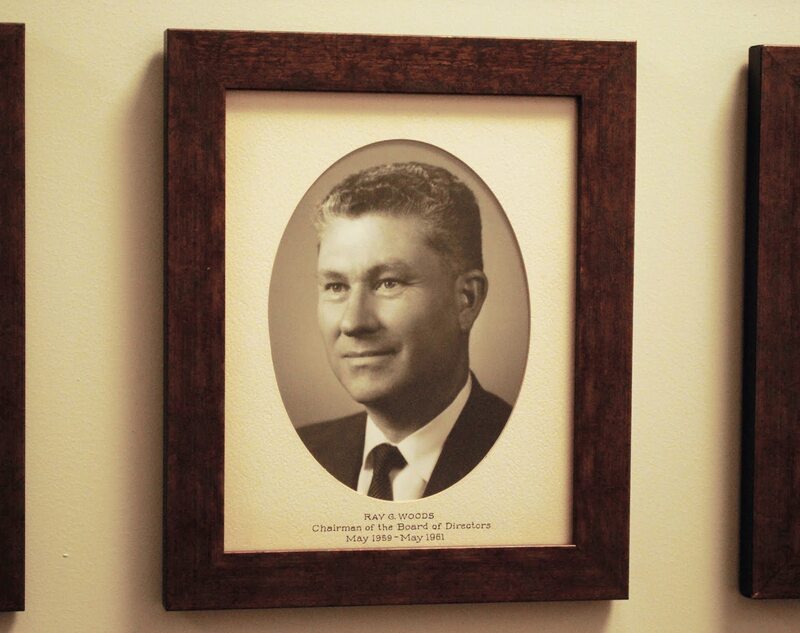 Conger, who divided the land into 84 lots for what became the area's first residential subdivision. And then came the auction of the Central School property for what became a thriving business center. ...During that year that had passed, the village of Pasadena had grown like Jonah's gourd, and became a town of nearly 10,000. The boom had smitten it and was at its apogee. ...J.W. Wood paid $3,750 for 25 feet front on Colorado St. Mr. Wood intends to put up a good building upon the lot, which is a very valuable one for business purposes. The total amount received for the Central School lot sales was $44,772. Imagine what five acres in Old Pasadena would go for today! A large portion of the proceeds were used for the construction of Benjamin D. Wilson School, including purchase of the land on North Marengo. Some scenes for the new NBC series "Outlaw" were shot at Pasadena City Hall this week, with interiors in the Council Chamber on the second floor and exteriors in corridors and the grand entrance. City Hall portrayed a federal courthouse in Mexico. If you saw a lot of police officers in non-Pasadena uniforms, they were actors and extras, and the weapons were strictly props. Here's what the backdrop in the Council Chamber looked like (note the blue duct as well). Filming is now complete, and today crews are putting everything back the way they found it. See our upcoming filming calendar here. The exterior photo was shot by the mighty Zack Stromberg of the Public Affairs Office; the interior shot was taken by City Manager Michael J. Beck.